MASKerade: Muse 71 - Thanks! I'm back with another take on this week's Muse challenge. One of the teachers at Kate's school has asked me to make a bunch of thank you cards for her so this seemed like a good opportunity to multi-task. I focused on the layered die cuts and even used some Lawn Fawn dp (I KNOW! ), using the cut outs from the base panel as the top layer of the Clearly Besotted die cuts so that they matched perfectly. I added in some sequins that were included in one of my recent orders. Here's a side view so you can see the coloured stacking. I hope you'll get a chance to play along with us - the deadline is Monday morning at 8 am EDT. At that time, you can vote until Tuesday morning at 8 and the results will be posted at noon. Hope to see you there! Ardyth!! DP!! Before you know it, you'll be splattering and tearing ;). I always love how you stack the die cuts with coloured card, gives a lovely effect. I know is right! Don't think I've ever seen you use DP :) Love the soft subtle background it creates. Fabulous take on the Muse challenge. The stacked die cuts and DP have a nice pop. The sequins are perfectly placed. I love your interpretation of the challenge card. Awesome die stacking! How do you get the edges line up SO PERFECTLY? The side view photo is great - really shows off the colors nicely! I knew you would rock this one, it's fantastic Ardyth! 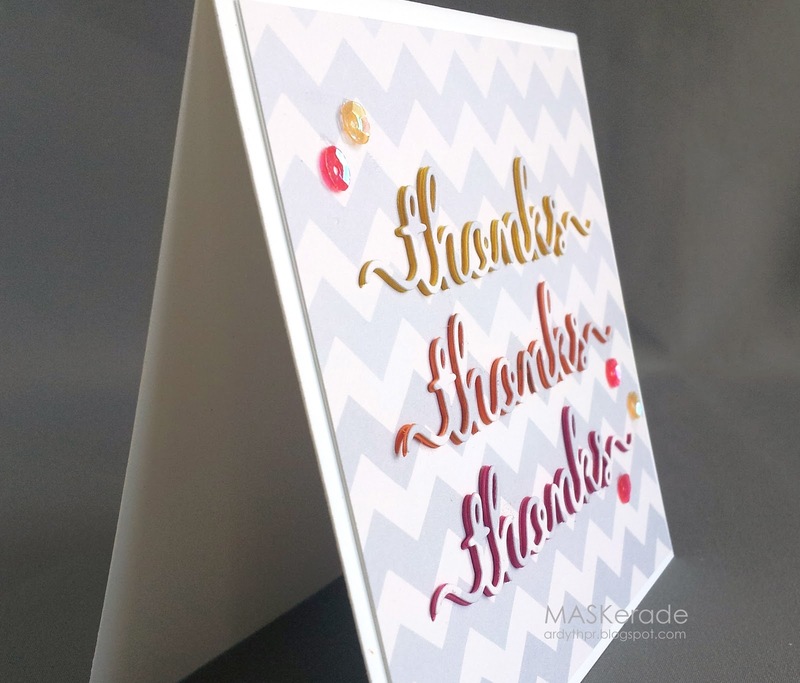 Love your stacked die cut technique! Your card is gorgeous. I haven't tried it yet as I think I don't have the patience or precision to glue those together. Love this. What a fabulous way to say many thanks--with many thanks.